Easily grown from seed, Nicandra physaloides is an annual which reaches approximately a metre in height. The large leaves and stems are covered in chocolate spots, making the plant interesting to look at even before the flowers appear. It flowers from June to October. 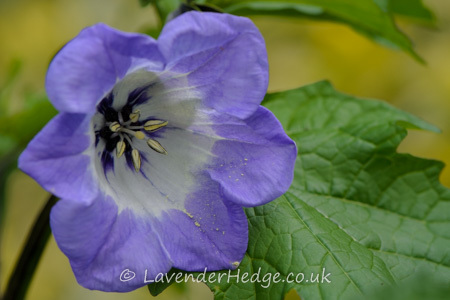 The pretty pale violet flowers are bell-shaped and only last for a day, although there are plenty of new ones emerging. A concoction made with this plant was supposed to repel flies, hence its common name. 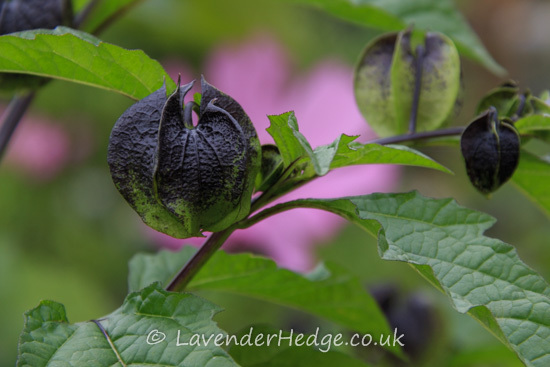 After flowering the seed starts to form and looks like a small Chinese lantern, these can be dried for winter flower arrangements. Alternative names: shoo fly, apple of Peru, apple of Sodom, Peruvian bluebell.